A Businessman is silhouetted as he stands under the Arche de la Defense, in the financial district west of Paris. There are more than 615 million people suffering from depression or anxiety around the world, an increase of nearly 50% from 1990, according to a new study published in The Lancet Psychiatry. Improving treatment for depression and anxiety, two of the most common mental health disorders, would not only have health benefits but also boost the global economy. The study, led by the World Health Organization (WHO), found that without global improvements to mental health care, 12 billion working days will be lost to depression and anxiety each year up to 2030. This amounts to an annual loss to the global economy of $925 billion. The study assessed 36 countries and looked at treatment costs and likely health outcomes for the period 2016-2030. It factored in a modest improvement of 5% in productivity as a result of treatment. On average governments spend just 3% of their health budgets on mental health according to the WHO. In low-income countries the figure is just 1%, rising to 5% in high-income countries. The research found that every $1 invested in improving treatment for depression and anxiety would generate a $4 return for the economy. She added that finding ways to make sure people have access to mental health services, wherever they live, is important. 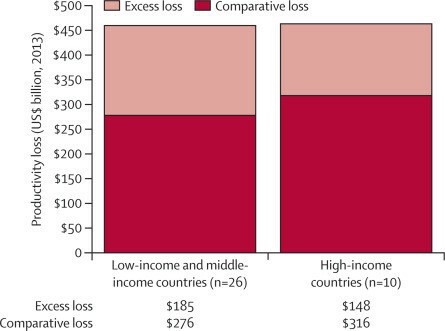 The cost of scaled-up treatment over the next 15 years would be $147 billion. This would result in a 5% improvement in labour force participation, worth $399 billion, as well as an improved health return of $310 billion. 10% of the global population is affected by metal health problems. Jim Yong Kim, President of the World Bank Group, says that the study shows that current mental health services are not good enough. “This is not just a public health issue; it’s a development issue. We need to act now because the lost productivity is something the global economy simply cannot afford. How can we bring mental health services to those who need them most?